Chef Heith Sheeley is a dedicated and passionate Chef who loves to cook and put his unique spin on old family favorites. Growing up in Texas and living with his great grandmother, he learned a lot about Southern cuisine and discovered his love for food early on in life. Chef Sheeley has spent more than 20 years in the food industry. Before he decided to pursue his interest in food at a professional level, he attended Iowa State University in the College of Business. His experience there has aided him throughout the years by providing him the knowledge of how to successfully manage and creatively embrace new aspects of the business world. While at Iowa State University, he was a proud member of Beta Theta Pi. He has gone full-circle with the fraternity from being a member, cooking for, and now managing their food services. Chef Sheeley turned his passion for cooking into a career when he decided to move to Kansas City and attend culinary school, obtaining his American Culinary Federation diploma. While in Kansas City, he held chef positions at Raglan Road, a high-end Irish restaurant in the Power and Light District as well as at Piropos, a unique and delicious Argentinian steakhouse. His time and hard work in the kitchen has now payed off for hundreds of college students as well as his family and friends. Chef Sheeley has made his way up in the company from Executive Chef to being the National Director for Greek House Chefs. He started as a catering chef for the company, and quickly moved on to cook for Beta Theta Pi’s Tau Sigma chapter, his alma mater. Now, Heith is focused on making sure that all chapters are receiving delicious and nutritious food that fits each of their individual chapter’s needs. 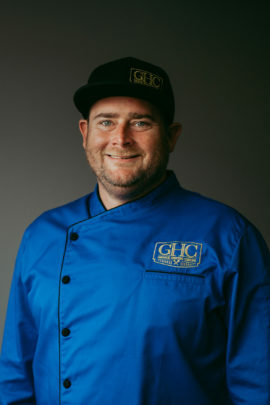 When he is not spreading the word about GHC’s wonderful service, he is working with chapters and their chefs on budgeting, quality control, and general client relations. With a high demand for Greek House Chefs’ fresh culinary throughout the country, Heith has enjoyed traveling to all of the new campuses and chapters making sure every chef that he places is not only fulfilling, but also going above and beyond the high standards that Greek House Chefs holds.